It’s that time of year again when everyone gathers around the table and indulges in all things sweet, savory, and decadent. 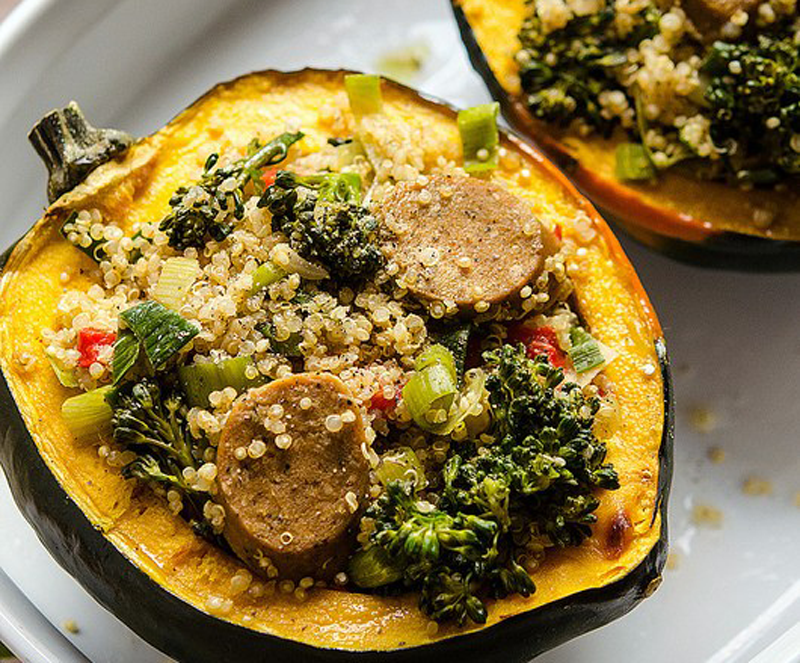 Treat your Thanksgiving guests to 10 of the most delicious vegan Thanksgiving dishes they’ll ever taste with our favorite recipes from around the web. We promise you’ll be the most popular person at the potluck! Pumpkin brings a smile to everyone’s face, but it should also bring fullness to everyone’s belly on Thanksgiving, especially if it’s Baked Pumpkin Ravioli with Rubbed Sage Cream from renowned vegan blog Olives for Dinner. Hearty and aromatic with the smooth richness of cashew cream, we can’t wait to loosen our belt a couple notches and dig in. We know Thanksgiving is on the way when grocery-store displays are dotted with squash of all shapes, colors, and sizes—and what’s cuter (and more delicious) than the acorn squash? 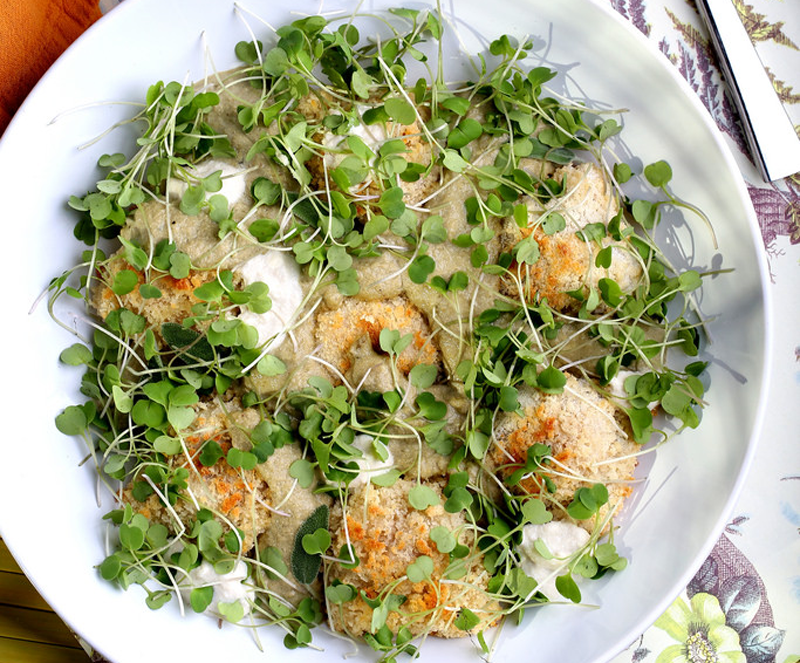 Food blogger Jackie Sobon baked and stuffed this fall favorite with quinoa. Dusted with Italian seasoning and topped with chopped broccolini and red bell peppers, this little squash is sure to be a star centerpiece on everyone’s plate. 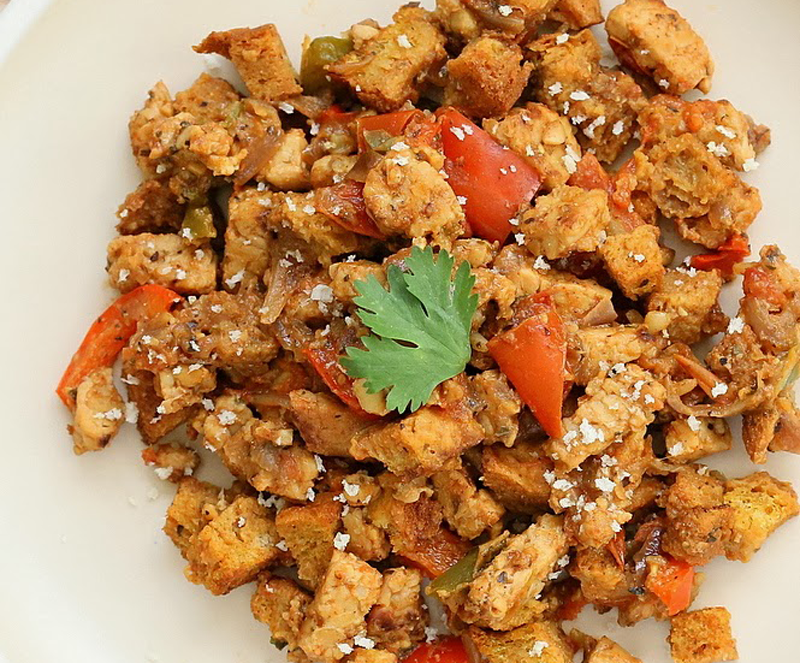 Whoever says you need turkey for stuffing hasn’t tried Vegan Richa’s Pumpkin Bread and Tempeh Stuffing. One bite of the flavor-bursting mushroom, onion, tomato, and spice pumpkin bread and tempeh mix, and we’re sure you’ll agree that there’s no need for any turkey (or any animals, for that matter) on any dinner table. At any Thanksgiving feast, the sides are just as big of a star as the Tofurky loaf. We think sweet potatoes are just as Thanksgiving-centric as pumpkins, and apparently vegan recipe veteran Kathy Patalsky agrees. 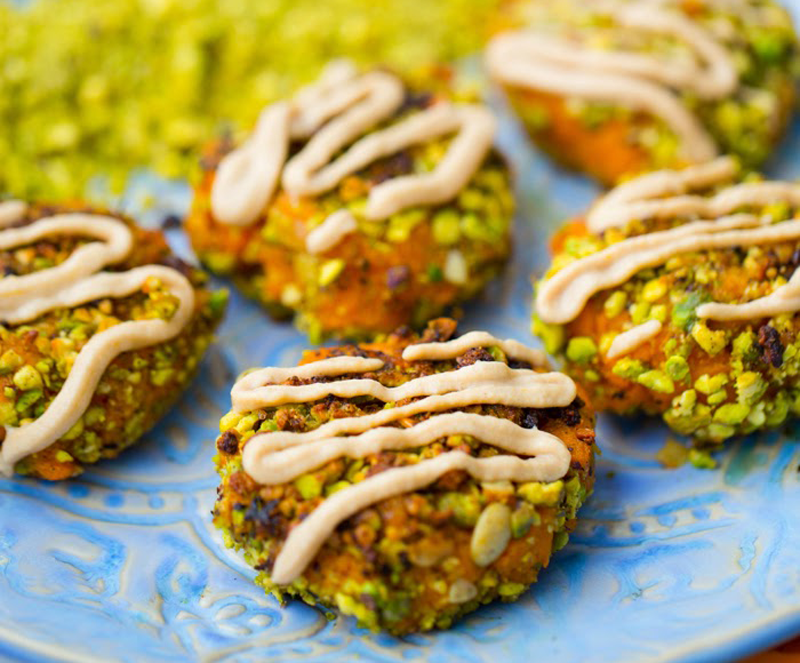 Her Smashed Sweet Potato Fritters have a warm, soft, sweet potato center that is accentuated with pumpkin seeds and pistachios, adding a nice crunch to every bite. While apples are the emblem of fall, Brussels sprouts are the iconic vegetable every child dreads this time of year—though we think the little green bites have been cast in an unfair light. 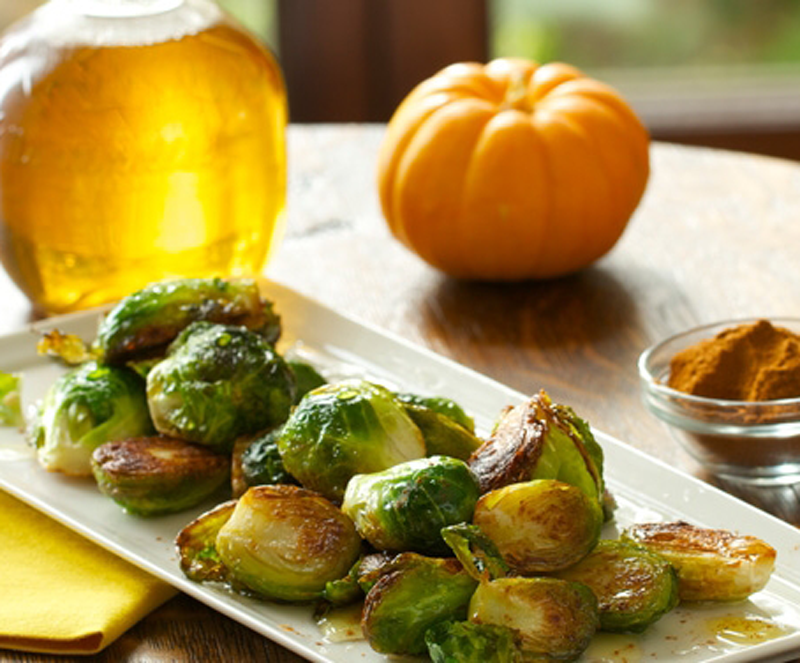 Leave it to vegan chef Chloe Coscarelli to save the day (and the sprouts’ reputation) with her scrumptious Apple Cider Brussels Sprouts recipe. Roasted to golden perfection with a sweet hint of cinnamon and apple, the kids at the table won’t know what hit ‘em. 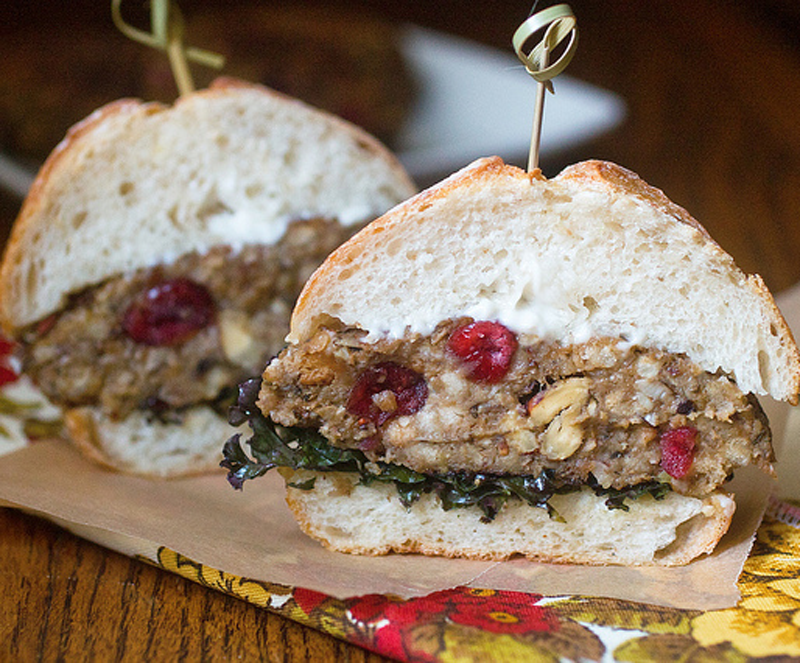 For the less culinary-inclined holiday host, long-time vegan food expert Isa Chandra Moskowitz of Post Punk Kitchen has whipped up a genius concoction—it’s all the tastes we love from Thanksgiving simplified in a sandwich. Cremini mushrooms, lentils, and hazelnuts lend a hearty flavor, while the cranberries add a sweet accent—all deliciously smooshed between two pieces of sourdough bread. A hand-held Thanksgiving dinner without the grueling hours of kitchen clean up? Yes, please. We can’t get over the gorgeous colors of this holiday salad, which is perfect for your Thanksgiving tabletop. Ohmyveggies’ kale salad is no ordinary stack of greens. 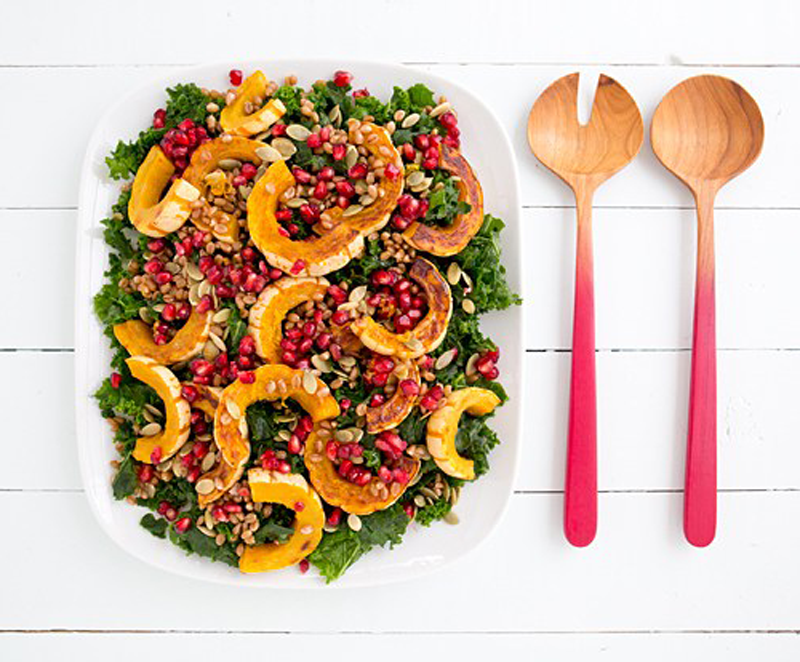 This salad is dressed to impress: kale surrounded by bright orange rings of baked delicata squash and dotted with ruby pomegranate seeds––all gently tossed in an orange citrus-maple vinaigrette. Though we never say no to a decadent dish, sometimes we want something sweet and simple, especially after hours of preparation, stirring, sifting, and steaming. Cue gluten-free virtuoso Allyson Kramer’s Roasted Maple Glazed Sweet Potatoes. Perfectly baked until ever so slightly charred on the edges, these spuds are coated with a special ingredient—vanilla! Genius. For those who throw caution to the wind and want to buck convention (who needs mashed potatoes and green bean casserole, anyway! 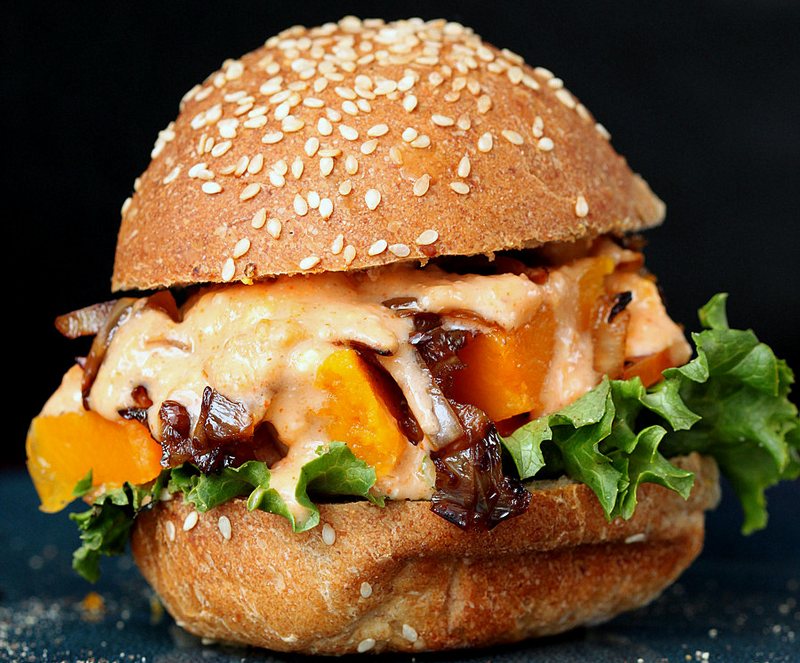 ), we give you Vegan Richa’s Roasted Butternut Squash Slider. This dish has the autumnal essence of Thanksgiving with savory squash and smoky caramelized onions but with a modern slider-twist. Plus, there’s a vegan mayonnaise-Sriracha combination to which we just can’t say no. 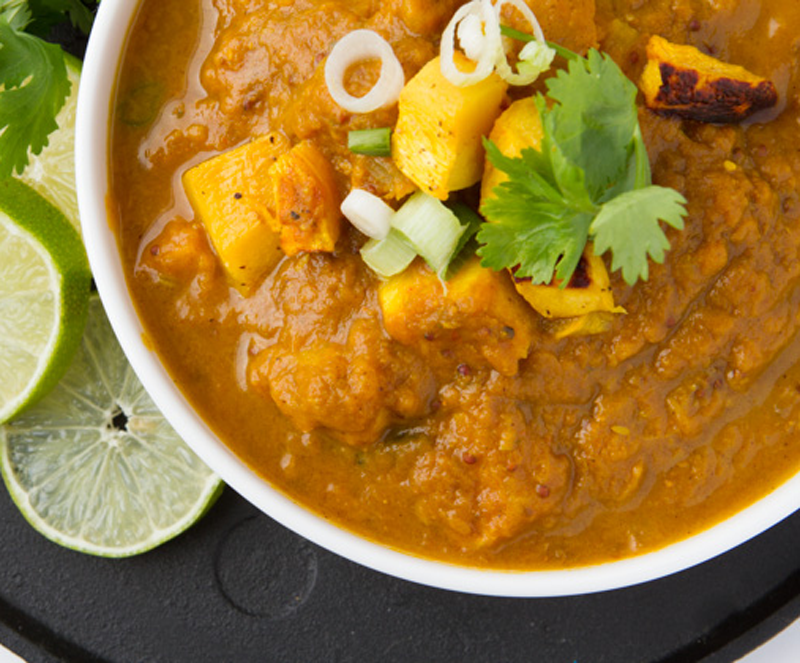 For those located in colder climates, we can’t think of anything more comforting and homey than sitting around a table with your closest family and friends while enjoying a warm bowl of thick pumpkin curry. Grain-, nut-, and dairy-free, and rich with the aromas of cumin, turmeric, and smoked paprika, curry might just be the next big Thanksgiving thing.